Remember: This weekend’s game is on Sunday! Don’t show up Saturday! Since Thierry Henry sent the Union to their second loss of the season, the Red Bulls have been on a run. 6-3-1 in their last ten, to be specific. New York head coach Mike Petke has found a balance and brought out the best in his team. Then again, what team wouldn’t play better with Thierry Henry back in the lineup? Yet, for all the stars that have come and gone through the Red Bulls lineup, it has been a mercurial guy from Salt Lake City who has been the biggest difference-maker this season. Behind Jamison Olave, Thierry Henry, and a resurgent Tim Cahill, New York is second in the Eastern Conference and looking like a true contender. Last time these teams met, the Red Bulls found a season spark as their star Frenchman turned and fired home a late winner to send them home happy. The ease with which Henry found space in the box turned out to be horrible foreshadowing of the problems to come for the Union defense. Coming off a shutout over New England, Philly would give up ten over their next six, settle down against Chicago, then implode against both LA and Montreal. It was a brutal stretch, and the praise is correctly heaped on Jack McInerney for turning what could have been a slide into mostly ties and smash-and-grab wins. Now the Union enter one of the roughest stretches of the season: New York, Dallas, Salt Lake, and Houston, a break for Chivas, then Portland and Vancouver. Coming off a blase performance in the US Open Cup, the team and its fans could use a statement game against a Red Bulls team that, while good, is likely overachieving. Philly catches their rivals at the right moment: Defender Jamison Olave is suspended following a red card in a loss to Vancouver, and midfielder Juninho is out through yellow card accumulation. While Juninho has been up and down this year, Olave has been a force. His typically dominant aerial displays have been paired with a more intelligent game that has seen New York own their defensive box. The off-season arrival has also contributed four important goals to a side that risks being overly reliant on its aging strikers to carry it through a long season. Philly has been dangerous on set pieces in 2013. I know, it still seems like a dream. Sebastien Le Toux’s dead ball service, Jack McInerney and Amobi Okugo causing havoc in the box — it’s been such a smooth transition from lost to effective that we hardly realize the Union are now a constant threat when Le Toux is over the ball. Unfortunately, those improvements have not translated to the defensive end, where opposing teams still find spaces and gaps on corner kicks with relative ease. Whether organizing on dead balls is an area that new arrival Oka Nikolov can help Zac MacMath is yet to be seen, but it sure would be nice. Small and often looking more bustle than useful, Dax McCarty has quietly developed into one of the better all-around midfielders in MLS. His late runs into the box have improved, and he has taken on a leadership role with Juninho drifting in and out of games. 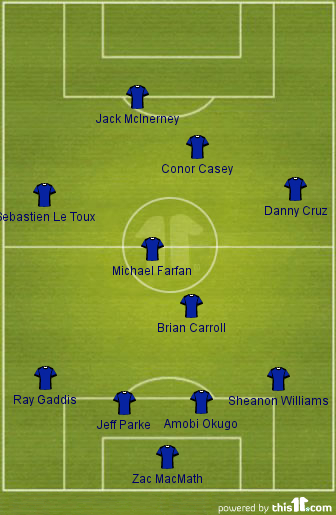 McCarty’s ownership of the center of the pitch has given freedom and opportunity to the wide midfielders. Two decidedly mediocre players, Jonny Steele and Eric Alexander — put those names together and you have a lame superhero and his secret identity — have been able to own their wings because they push high and keep the pressure on all match. McCarty gives them the freedom to do this but still manages to get involved in the half-court offense when New York slows things down. It is particularly important that the Union keep an eye on McCarty since he fits the mold of a player who gives them fits. Able to drop deep and move the ball, McCarty can force Brian Carroll to step up too high if Keon Daniel plays a passive defensive game. Near the box, McCarty tends to arrive late, which could find him space against a Union defense that compresses deep in the box once the opposition arrives. All the success of Jack McInerney can make it seem like the Union can forgo the bother of ball movement and just get it to their star striker as quickly as possible. This, of course, is a bad idea. Somewhere in New York, Houston, Salt Lake City, and Dallas, there are assistant coaches who spent the past two weeks devising game plans built around turning McInerney into a frustrated figure. Attacking from different angles is necessary to keep the defense off balance. The Red Bulls are likely to play a fairly conservative back line on the road with Olave out. Involving the wingers early and high up the pitch will open the gaps the Union need to bring Sheanon Williams and Ray Gaddis into the game. Too often the fullbacks receive the ball in their own half. This is not where they should be involved. Push the defense back, then let the fullbacks fill in the space. Like all Red Bulls games, there will be plenty of feet left in and chippy moments. Staying focused despite these incidents is of paramount importance. Thierry Henry needs half a chance at most, and Fabian Espindola has been a Union-killer in the past with his power and pace. With Olave out, the Union can’t be afraid to play the early outlet if they get pressure in the back. There should be clear instructions and pregame plans outlining who that outlet is and where they will be on the pitch. Aimless punting makes the Union no better than the Flyers during free agency, but playing simple and avoiding situations where mistakes (like the two that handed DC United the USOC match) that can change a match instantly is nothing to be afraid of. Steele had a strong match against the Union in March. He pushed high, wasn’t tracked, and became a thorn in the Philly side all afternoon. By opening up the left side of the pitch, he created the spaces that were exploited for the winning goal late in the match. If Sheanon Wiliams can get involved early and often, Steele won’t be able to camp out in the Union’s half. This will go a long way toward helping the Union control the tempo of the match. Mistake-free football from the young goalie is a must. No poor punches, mental breakdowns, or hesitancy. Not only do these things show that MacMath still has a long mental road ahead of him, they force the defense to play deeper and overcommit to filling the shooting lanes when they should be keeping shape and preventing runs in behind. MacMath needs to be solid from the get-go so the team knows it can trust him during this tough run through the upper echelons of MLS. Is Kleberson done? Since he came out with a hamstring injury several weeks ago, it seems like he has dissappeared. He’s been out due to that injury. I thought I read that he may be 100% for this game, but we shall see. We might have to work him back into fitness again, as well. mlssoccer.com is reporting that Tim Cahill is also out for the energy drinks, which can only be a good thing. I like the Unions “send kneecapping thugs to all the other teams best players” strategy. As mediocre as red bulls wing options are, I’d take either one at the moment. McInerney article in the inquirer is very cool.